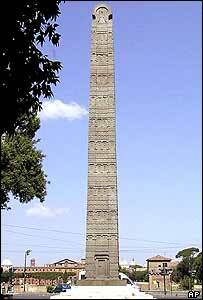 ADDIS ABABA (Reuters)a's 1,700 year-old obelisk, returned to the country 14 months ago, will be re-erected after the rainy season that ends in September, the U.N. agency in charge of culture said on Monday. Stolen by Italian fascist invaders in the 1930s, the Ethiopian national treasure was returned in April 2005, but has remained in boxes awaiting re-installation at its original site in Axum, once the centre of a powerful trading empire. "Everything needed to re-erect the obelisk including funding and technical experts are ready," Awad Elhassan, the U.N. Educational, Science and Cultural Organization's (UNESCO), representative told Reuters in an interview. "But re-erection will have to wait until the end of the rainy season which goes up to the end of September." Plundered in the middle of Italy's 1933-1941 occupation, the 160-tonne obelisk was raised in Rome by Benito Mussolini as a symbol of the fascist victory against Ethiopia. Three pieces of the 24-meter (78 feet) obelisk are still lying in metal shipping cradles in a field with more than 120 other similar funeral monuments in Axum, 850 km (530 miles) north of the capital Addis Ababa. Awad said the re-erection of the obelisk at its original site would not damage newly discovered underground funeral chambers and royal arcades used by several dynasties before the Christian era. A thousand years before Christ, Axum was the city of the legendary Queen of Sheba and the heart of the Axumite civilization, one of the greatest in the ancient world. Ethiopians see themselves as the descendants this kingdom. Legend has it that God bestowed his favours on the city after the queen's son Menelik I stole the Ark of the Covenant from his father King Solomon in Jerusalem and took it to Axum, where many Ethiopians believe it remains. This entry was posted on July 31st, 2006 at 09:58 by apache and is filed under Ethiopia, Culture and Society.